In this video, you will program your sprite to talk while its mouth is moving. To make the sprite say something use the say block. 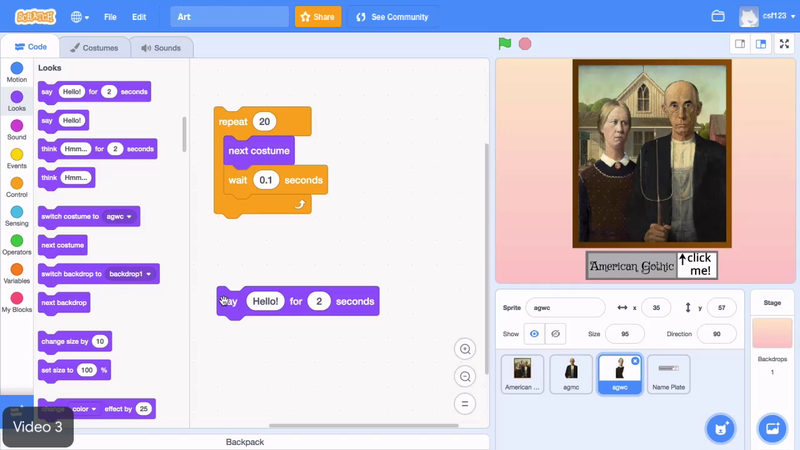 The say block has two sections, the words the sprite says, and how long it says them. In this example, the sprite says, "We both look very bored," for two seconds. But you can make your sprite say anything for however long you want. Tinker with the time and the wording until you are happy with what's happening in your project. To run this code, you have to click each block stack. This looks kind of weird. To run two stacks of blocks at once, you could use the same event to start both. Go to the events menu, and drag a when-this-sprite-is-clicked block onto both block stacks. The mouth should move, and the sprite should talk. You are using a computer science concept called Parallelism. Parallelism is when you run two blocks of code simultaneously. In this case, the sprite both talks and changes costume at the same time. Now that you have your two block stacks, add more say blocks to your code. Also, program the other sprites to talk as well. Click on the new sprite. Add a when-sprite-clicked block and at least two say blocks. Have fun customizing your project by having the sprite interact with the user and other sprites. When you finish, go to the project page and add instructions about how to interact with your project. Drag out a say block. Give the sprite something to say. Add a when-this-sprite-is-clicked block at the beginning of the code for the mouth animation and the say block. Program the other sprites to talk using at least two say blocks. Add instructions to your project. That will complete today's core project. Use the "when this sprite clicked" event block to make the sprite respond to a mouse click. Make the sprite talk and move at the same time.